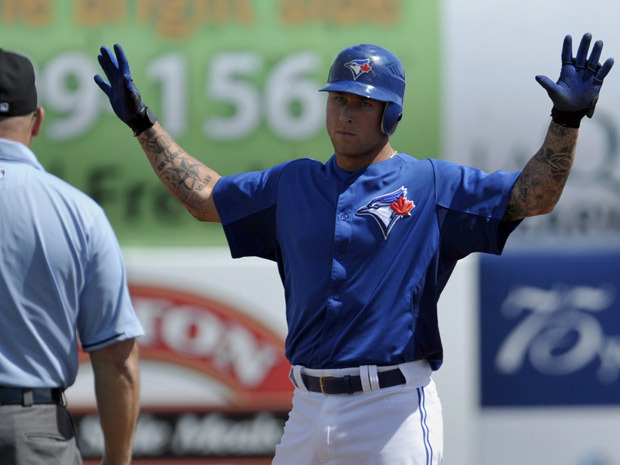 Jays rookie phenom third baseman Brett Lawrie is looking good in the eyes of a Red Sox fan. The best thing for the Jays this week? The Winless Red Sox coming to town for the opening series at the Skydome. With the first weekend in the books, I’m of two minds on the Jays opening weekend. So in interest of being fair to both sides of my thoughts, I will present the positive and negative sides of the Jays first three games. Positive: The Jays won two of three against the Cleveland Indians and had a chance to sweep the road series, but came up a run short. Anytime you win a road series, you’ve got to be happy. Negative: While the Jays did win a pair, they could have just as easily lost all three games. Two extra inning games on the road can go either way. Positive: Even without a good start from ace Ricky Romero, the Jays won two of three and the bullpen, a weakness last year, did a nice job holding off the Indians bats in the extra inning contests. Brandon Morrow looked good in his first outing, a good sign for all Jays fans. Negative: Romero didn’t pitch well, Joel Carreno didn’t look good in his start and Sergio Santos blew a save in his first opportunity. The Jays starters were heavily out pitched by the Indian starters. Positive: What more can you say, these guys are never out of a ball game and proved it with late inning and extra inning heroics. Brett Lawrie looks like he’s going to pick up where he left off last season and Jose Bautista has bashed his first homerun. Kelly Johnson had some nice at bats in the series and J.P. Arencibia was the hero in Game 1 with a three-run blast. The Jays took advantage of the Indians bullpen and were one-hit away from possibly sweeping the Indians. Negative: The trio of Justin Masterson, Ubaldo Jimenez and Derek Lowe dominated the Jays in the series. The trio threw 26 innings, allowed eight hits and three earned runs while striking out 14. That’s a 1.04 ERA for Cleveland starting pitchers. A team with a better bullpen could have made the Jays 0-3. Arencibia had an important hit, but the guy has to get more than one in a series to be an everyday starting catcher. Colby Rasmus needs to be better at the plate. Unlike my colleague Strader, I don’t believe good defence from Rasmus is enough. He has to hit like an everyday centerfielder, but it’s early and I still believe that he can be a good offensive player. You have to like the Jays opening weekend. The team played with a swagger and never gave up on any play. Outside of Morrow, the starting pitching wasn’t great, but it wasn’t terrible – basically it was average. Lawrie is a lot of fun to watch, he gives maximum effort on every play and, as I said earlier, the bullpen looks much improved and Santos should be fine. My verdict is while there are more positives than negatives, the Jays need to be able to hit starting pitching and not depend on late inning comeback every time, although it is exciting. The pitching was average and still the team won two games, but now we’re into the part of the staff that is a real unknown. While Sunday’s offensive explosion was nice to see, Boston has struggled on the mound. Besides Lester’s performance on opening day, the Sox have not had good pitching and the bullpen is a huge weakness as Aceves has blown two saves. Honestly, it will be a long year in Beantown if Bobby Valentine can’t right the ship. I expect a high scoring game between the two as the biggest question marks for both are the back end of the rotation. It should be a great night at Skydome (I’m following fellow Write Fielder Livingstone’s lead in refusing to call it Rogers Centre). Livingston and Strader will be blogging from the stands, so check the site for some instant insight and photos from the home opener.